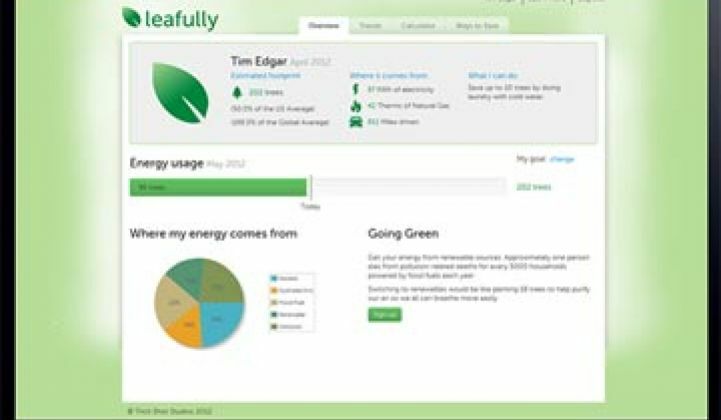 Forgoing kilowatt-hours for trees gets top honors for a Green Button apps contest. If you were to ask 100 people to define a kilowatt-hour, you'd probably get some blank stares and a few interesting answers. If you asked 100 people to define a tree, you would get slightly varying answers, but essentially the same answer. 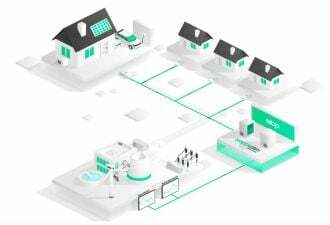 That is the idea behind Leafully, which just walked away with the grand prize and $30,000 from the U.S. Department of Energy's Apps for Energy contest. The app links with your Facebook profile and gives energy usage in terms of trees, which is a more meaningful term to the average person than a kilowatt-hour. It also offers an overview of energy usage, trends, a calculator and ways to save. Leafully, like many other apps, looks at baseload power, which it calls “sleeping energy,” as well as peak power. 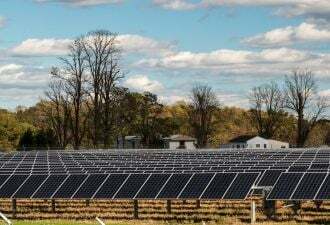 The app translates energy use into number of trees saved, but studies have shown that only a portion of the population is motivated by environmental concerns when it comes to energy savings. Even if the winner focused on trees instead of dollars, the power of apps overall should not be underestimated, according to Todd Park, U.S. chief technology officer. He told the utilities present at ConnectivityWeek 2012 in Santa Clara, Calif. to “embrace the power of the crowd” for more rapid innovation. The Green Button, which was announced last fall, is a feature that allows residential and commercial customers to download detailed energy-use information in a standardized format to better manage electricity consumption and cost. Approximately 30 million utility customers will have access to Green Button data by the end of this year. More than 50 apps competed for the prizes, covering everything from assessing rooftop solar PV for your home to small business energy management applications. The second place prize of $15,000 went to Melon Power, which was the only company to leverage Green Button data to make it easy for commercial buildings to get an Energy Star benchmark score, a process that is mandatory in various cities and states. Third prize went to VELObill, which allows customers to view their utility usage and measure whether it is high or low compared to peers and to find ways to save money. An app that simply makes the utility bill itself more understandable is badly needed, especially when you consider that most bills don't even explain their terms. The student winners came from University of California, Irvine with the Wotz application, which uses a landscape picture to show baseload and regular energy use. It breaks this data down into everything from MacBook Air charges to cheeseburgers, and also has challenges, including a Tetris-inspired game. In a separate contest, Benchmarx won the Biggest Energy Saver Apps Developer contest, which was sponsored by Oncor, CenterPoint Energy, Grid21, Landis+Gyr, Itron, GE, IBM and Tendril. Benchmarx's original application was for the commercial sector, to help companies understand energy use and comply with benchmarking. The company tailored its software for the residential experience and won $50,000 in the contest.